This happy chicken seems to jump out of the card! Print out the chicks, color them, cut out and put all the parts together on a card. Happy Easter! Easter cards with adorable bunnies! 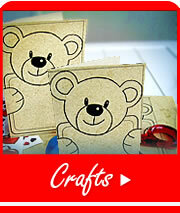 Print out cards and color with colored pencils. Two bunnies: a bunny girl and a bunny boy. 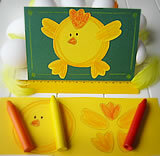 Print out egg templates and let kids decorate them! Attach two pretty feathers under the egg with glue or rivets.